Images and main text c. 1190–1200 CE; additional text c. 1290–1300 CE. Although Jerusalem remained at the heart of the Christian imagination between the sixth and the twelfth centuries CE, it was not until the city came under Christian rule during the Crusades that it began to be mapped with detail comparable to the Madaba mosaic map. Approximately fifteen such maps are known from the Crusader period (1099–1187). 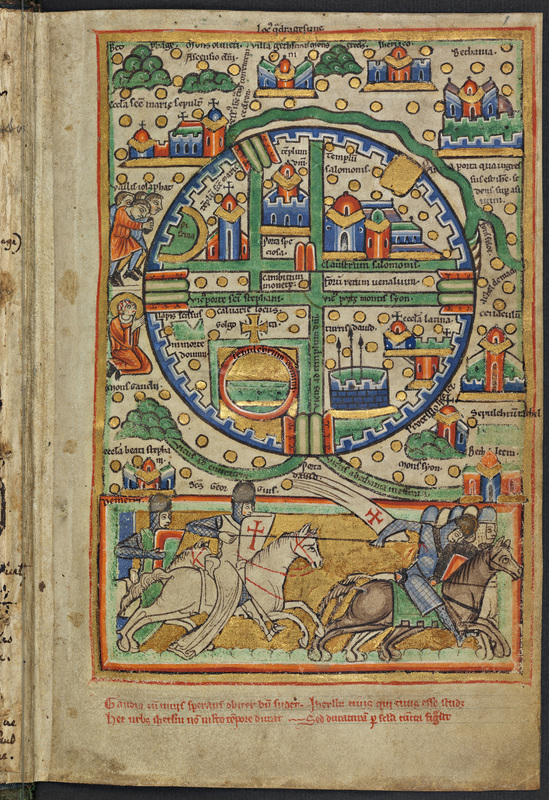 Combining apocalyptic images of the New Jerusalem with the cartographic tradition of representing the world as a circle with Jerusalem at its centre, these maps present a peculiarly circular image of the holy city. The map shown here is a beautifully preserved example known as the Hague map, which produced in connection with the first Crusade. It offers a detailed rendering of the city, with Jerusalem is depicted as a walled city. Like the Madaba map and the Hereford Mappa Mundi, the Hague map presents a synthesis of reality and imagination. While not including fantastical beasts, the map takes liberties with the geographical layout of the Holy City, prioritising the presentation of Jerusalem in cruciform rather than according to its cartographic realities. The map also takes liberties in its presentation of the city’s architecture. For example, it shows two temples on the Temple Mount: the templum domini (the Temple of the Lord) and the templum salomonis (the Temple of Solomon). The buildings marked as such were, in actuality, the Dome of the Rock and the al-Aqsa Mosque, which the Crusaders converted and renamed as churches. The continuation of this elision between the Dome of the Rock and the Temple of Solomon may be seen in Reuwich's map of the city, four centuries later. The overarching effect is a map that simultaneously erased Islamic influence on Jerusalem whilst glorifying and celebrating the Christian heritage of the city. As such, the Hague map offers an important witness to the struggle between Christians and Muslims over the Holy City, its architecture, and, indeed, its history. Indeed, this sense of Jerusalem as a place of conflict is heightened in the map itself, as mounted Crusaders speed across the bottom of the map, giving chase to several fleeing Saracen fighters. The figures have been identified as St George in the lead, with St Demetrius of Thessaloniki following on behind.